Designer Maxim Velčovský has created a 10-inch-tall porcelain vase called Factory. Commenting on industrial pollution, the design turns a something which usually emits harmful smoke into something from which a delicate flower emerges. Frank Lloyd Wright also designed a skyscraper vase. The ceramic Teco vase stands an impressive 22 inches high and was originally designed in 1905 by the famous Prairie School architect. The San Francisco Museum of Modern Art owns one in its collection. 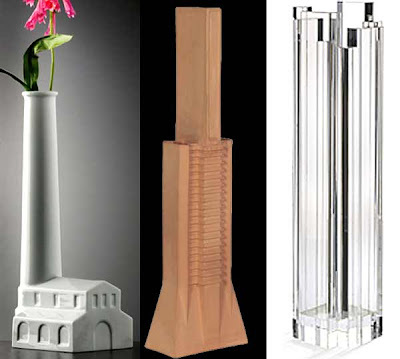 Boym Partners have created another architecturally-inspired item – the Skyscraper Vase. Made of a carefully balanced assortment of miniature crystal towers, the flower holders are available in different sizes and colors.